Download your starter pack here. The starter pack has the full details of the comp, as well as a bunch of things to inspire you and help you create an awesome entry. 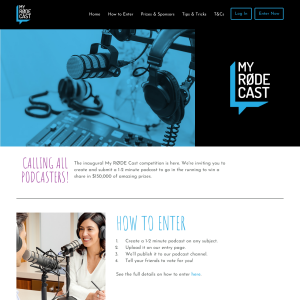 Create your podcast! It must be 1-2 minutes long, can be any style – documentary, narrative, chat etc – and on any topic you choose. It needs to be recorded as a single stereo audio file, either MP3 or WAV format. Upload your podcast on the upload page. We’ll check it meets the terms and conditions, and then publish it on our podcast channel. It will then be available for everyone to listen to. Tell your friends, and get them to vote for your podcast on this site. There's a juicy People's Choice prize up for grabs, so share it as widely as you can!